We visited Cragside during a happy trip to Northumberland last year, its a jewel in the National Trust crown and the former Victorian home of Lord and Lady Armstrong. He was a focused and driven industrialist, civil engineer and inventor, she was a talented botanist and socialite. Armstrong amassed his huge fortune through hydraulic inventions and as an arms manufacturer. At 53, he decided to build a country home in Northumberland and appointed the architect Richard Norman Shaw to design the house, he had the land cleared and using dynamite created a crag on which to build. Armstrong was also said to be a landscape genius and following the purchase of the barren Northumberland land destined to become Cragside, he designed, constructed and together with Lady Armstrong directed the planting of 7 million trees and shrubs in under 40 years. Initially employing 150 gardeners to assist them which tailed to 70 maintenance gardeners when the planting was completed. Tumbling down from the house, with a view of Debdon Burn is the largest man made rock garden in Europe, 3.5 acres in size. We scrambled down through the rocks towards the Burn. We were told had we visited in May or June the display of Rhododendrons and Azaleas on the Rock Garden is fantastic. The views along the Burn made up for it. Cragside stretches over 1,000 acres and has 40 miles of footpaths winding through woodland planted with native and exotic conifers – Noble Firs, Douglas Firs, Wellingtonias, Monkey Puzzle, Spanish Fir, Greek Fir and many more broadleaf trees. 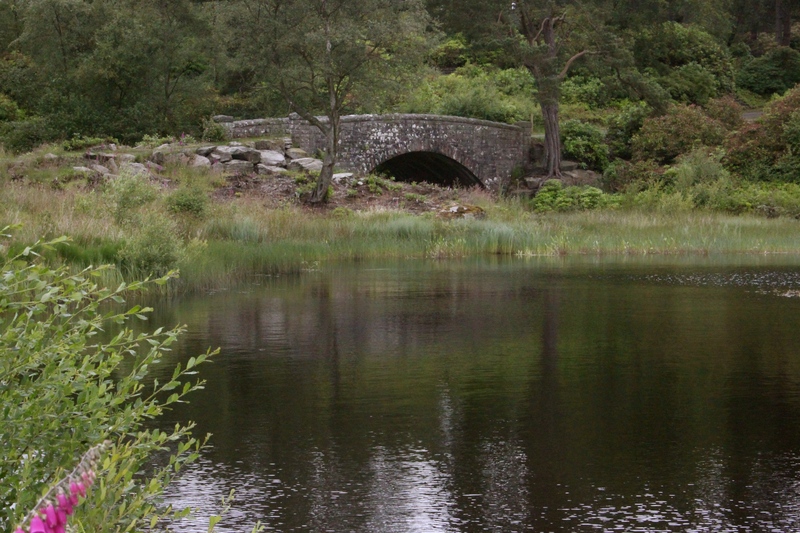 There are four artificial lakes, which were used in Armstrong’s time to generate hydro-electricity. The house was the first in the world to be lit by this method, using incandescent lamps first invented by the Sunderland born inventor Joseph Swan and by coincidence at the same time that Eddison was working on his invention too. (Later in 1883 the Eddison & Swan United Electric Light Company was formed in Newcastle). 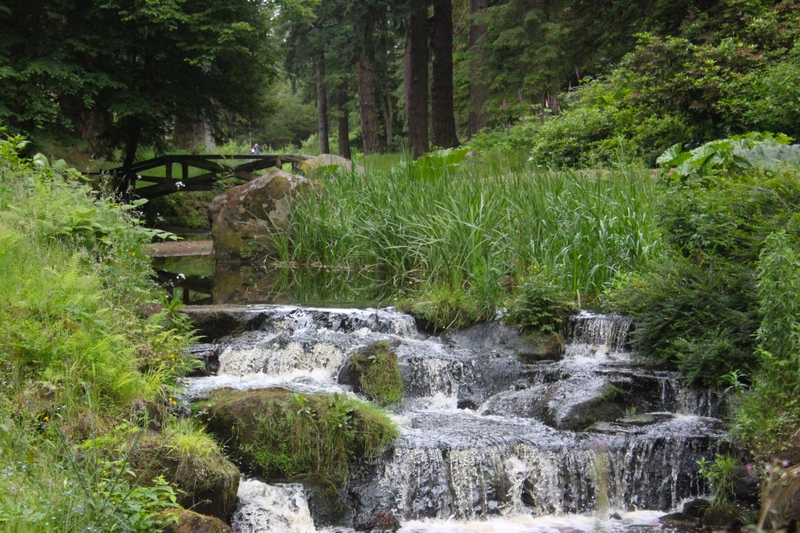 In 2014 Hydroelectricity was brought back to Cragside with the introduction of an Archimedes screw, the green energy project continues the work of Lord Armstrong. This modern hydro system will produce enough energy to light all 350 light bulbs in the house and will produce 12kw of electricity a year, providing Cragside with around 10 per cent of its electricity. Our visit coincided with the Lux exhibition, seven contemporary art installations looking a little out of place and met with mixed reactions but a really exciting dimension within this historic house. 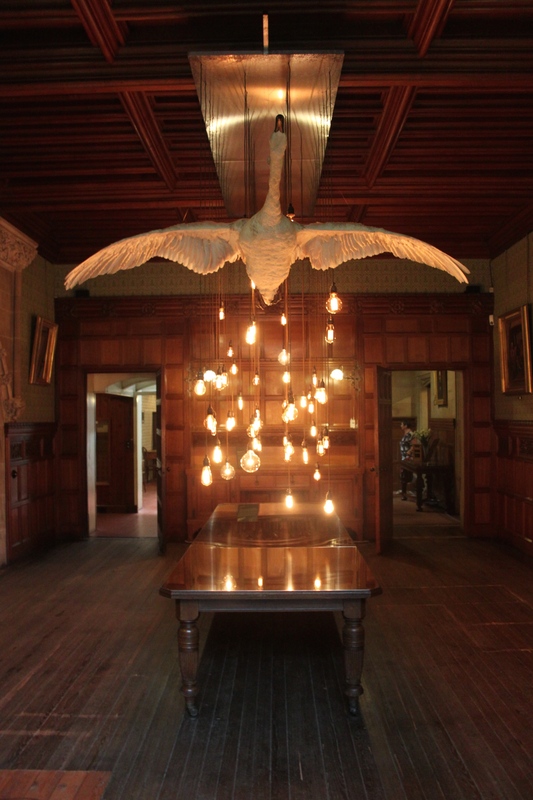 This exhibit was designed by Imogen Cloet, the 54 bulbs refer to the original domestic installation of Joseph Swan’s incandescent light bulbs at Cragside that were also lit by Hydropower. Cragside also has a formal garden, reached through an optimistically signed gate. We walked across the famous Iron bridge, through the Autumn Colour walk, green of course when we visited in July and into the Formal Garden, the Temperate Fernery and Orchard Glass House. Cragside was recently featured on the television programme Glorious gardens presented by Christine Walkenden, the very short clip saved here shows the formal garden off beautifully with an overhead shot of the whole area, including their traditional carpet bedding display which takes 6 weeks for the gardeners to complete. A lovely blog written by Holly, a National trust trainee gardener covering the last year at Cragside, is a wonderful behind the scenes insight, if you would like to discover more. Closing the gate, we headed off in the car across the rugged Northumbrian countryside to the Keilder Observatory to watch stars in the UK’s largest area of least light pollution. Nightime drizzle and low cloud put paid to that plan and not a star was seen but we shall try again on our next visit to Northumbria. What a wonderful example of Victoriana. 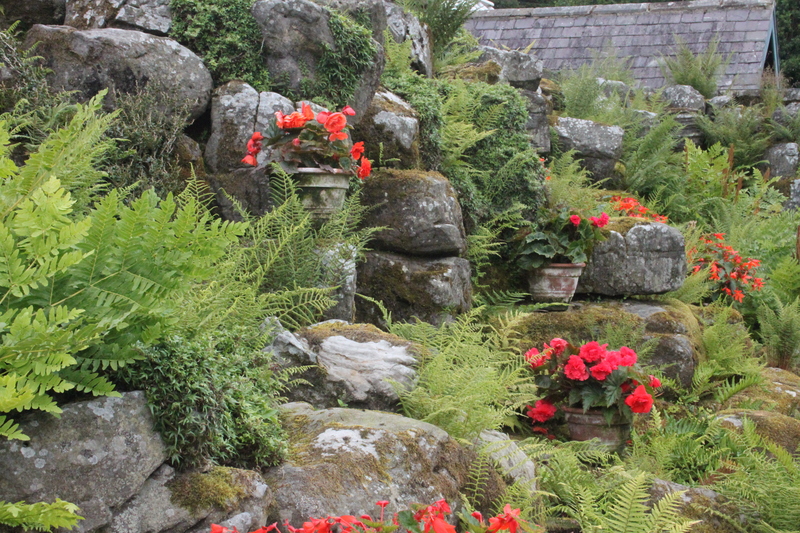 Nice rocks, nice ferns, but begonias in pots? Himself has just enquired whether there were any gnomes? Sorry collapse in giggles. Not a single gnome was spotted, we did a double take at the Begonias, maybe they were a nod to Victoriana too…it was an age of oddities. Glad that made you laugh though! That is quite some project! It sounds a really good place to visit. Dogs are allowed too, although not in the house, but a great place to walk and talk. How many gardeners?!!! I’d settle for just one to help me out. 😉 It looks like a wonderful setting. I enjoyed the link too Julie, thanks. Wish I could see all the lovely garden programmes you get on British TV! Cathy, some are available on You Tube, my favourite this year has been “The Big Allotment Challenge”, I think you would like it, its a light hearted competition where participants work in a beautiful walled garden then create something to eat, a flower arrangement and show something they’ve grown too, it ran for 10 weeks, its a real feel good show. I’ll have to take a look Julie. Thanks for the tip! Julie, what an interesting place you’ve described. Would love to visit there. I watched the clip and it helped me see what I’ve been missing in trying to get the planting right for my meditation circle is carpet bedding and 70 maintenance gardeners. Haha, Susie, 70 gardeners would be rather nice! I’ve seen all sorts including Lettuces used in Carpet Bedding designs, its gone out of fashion as its so labour intensive but I quite like it. That’s so interesting, I’ve never heard of Cragside. So beautiful and lush–wouldn’t it be nice to have a summer home in Northumberland. Love the door–wonder if it works? Northumberland is truly beautiful, we’d love a summer home there too! 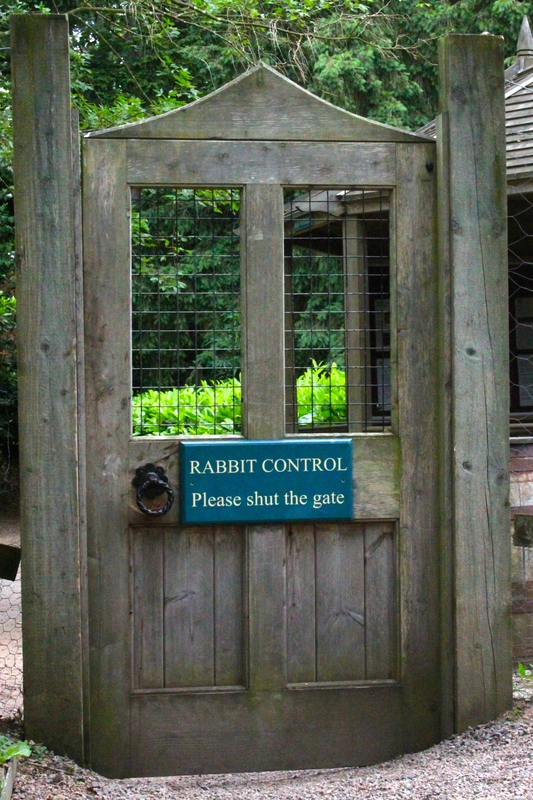 We did not see any sign of rabbits or damage in the Formal Garden, maybe the door really does work. thanks for the post, Julie. 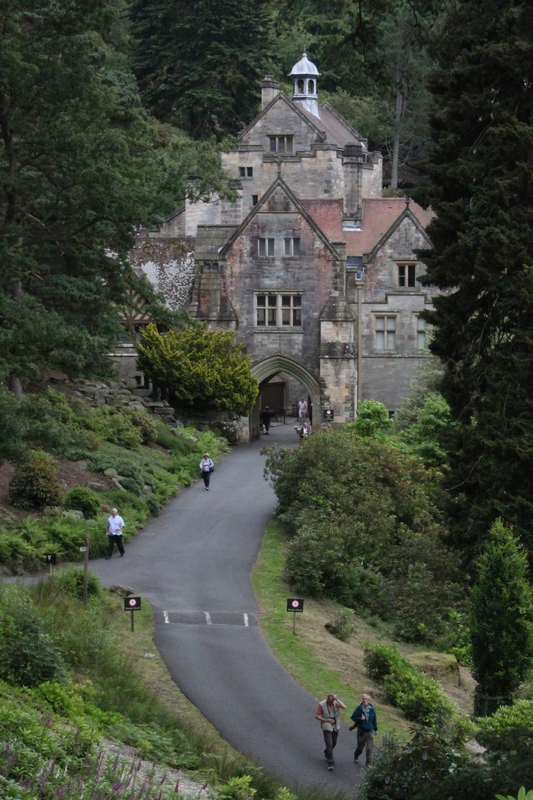 I had not heard of Cragside…what a fantastic creation. That was our first visit to Northumberland and Cragside, its so beautiful, we shall definitely be making further visits. 7 million trees? Now that is the way to garden. I wish I could garden on this scale. Dynamite to rearrange the landscape and then the resources to buy whatever plants took my fancy. Mind you, with 7 million trees you wouldn’ t be able to lavish the love and care on every single one, as we do with the trees we plant. I know they probably didn’t nurture precious plants but oh to have that wonderful mind and amazing vision, plus the plentiful resources! 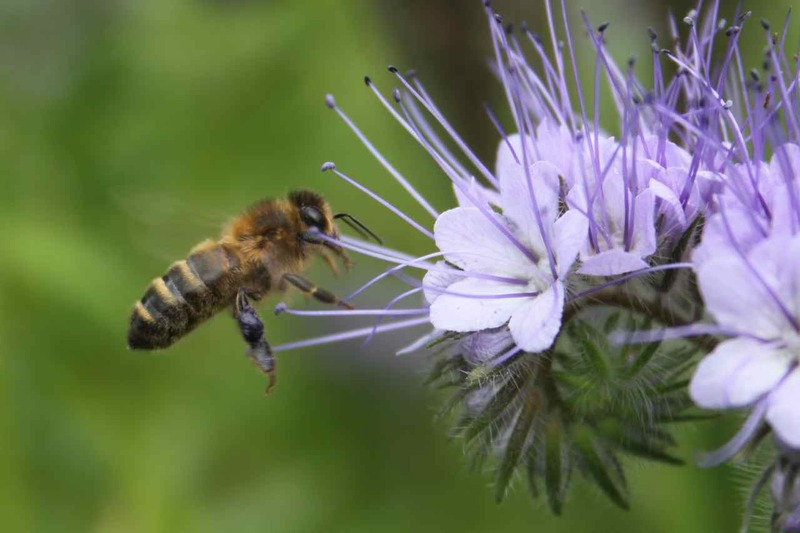 Wonderful piece on a garden I’d never heard of before. Really wish it was closer to us. We’d visit in a shot. What inspiration and scale of design. I wonder how much of his wealth came from arms, vs. hydraulic inventions?? It never fails to amaze me how grand some Victorian designs were – this one looks like it must be one of the largest of the NT’s portfolio? I recently watched a series on Armstrong by Johnathon Meades on You tube, which then led me on to some written pieces about Armstrong’s arms dealings, he sold to both sides of a conflict. He was a fascinating character, employing 25,000 people at his factories on the Tyneside. Also a great benefactor and credited with founding Newcastle university. I can’t think of another property thats larger, its just fantastic that we have charities ensuring these old properties can be enjoyed by everyone now. Lovely informative post. We visited Cragside – well, I was going to say a few years ago and then I realised it was nearly fourteen years ago when my eldest daughter was still at school. We didn’t do too much walking as our youngest daughter was only four! We didn’t see all over the gardens and I seem to recall that they were restoring parts of it at the time. The house is amazing and the views superb. This was our first visit to Northumberland Clare, I am not sure why but it will not be our last, we loved the scenery, people, even the weather was very kind to us! Yes, we love it there too. We have been a couple of times and hope to go again sometime soon. What lovely comments, thank you! I can’t recommend enough that a visit is a must if you are ever in Northumberland. And if you come across one of the four full time gardeners or myself (I am working as a seasonal gardener this coming summer) please come and say hello. It’s not somewhere we have visited, yet, although I have seen and read much about it, in particular that it was the first place to be lit by electric light. It all looks so natural, it’s hard to imagine all those stats behind it! Before visiting we had not realised the electric light connection, it was quite exciting to realise we were in the first house ever to be lit in this way. What a lovely day out, Julie! As always I envy you guys in the UK with all these fab places to go to. I always get excitied on the motorway when I spot the brown signs pointing to some magical place that cries out to be discovered. Northumberland is an area I’ve not visited so far but maybe one day. Have a nice weekend! WOW! What an incredible place! I will have to put that on my Must Visit list. It must have cost a fortune to create such an estate. I wonder where they found 7 million trees to buy! Yes! the logistics of gardening on that scale are mind boggling aren’t they, Northumberland is really beautiful I hope you do get a chance to visit. Great to read your post and photos of Gragside, we visited there a few years ago, very impressed with the garden and house. The victorians had tremendous vision and imagination. We should be making more use of hydroelectricity today. We were really interested in the Hydro electricity too Brian and absolutely agree with you. Julie can you believe this is a garden I have never heard of….what a lovely spot. We were not aware of Cragside before visiting last year either Donna, we are fortunate to have the National Trust charity, who maintains these places for all to enjoy now. Carpet bedding reminds me of my childhood too, the displays always make me feel nostalgic and look good fun. Thats a thought too, that gardens of our childhood are now historic! What a remarkable garden. Sounds like you could spend several days there and still leave much unseen. Oh, to have 1,000 acres, unlimited funds, and 150 gardeners. Absolutely, I think I could make very good use of that opportunity! What a beautiful place. Thanks for the tour, Julie. Glad you liked it Cynthia, If time allows we’d very much like to go back this year.